Flashback from my image library this morning to the British Fashion Council Vogue Fashion Fund winner (2015), Mary Katrantzou Spring Summer 2016 show. The collection was a wonder of technical skill, pure craftsmanship and dexterity. Each look was different from Mermaid friendly crystal encrusted sleeves to minidresses with flirty skirts and tailored silhouettes. 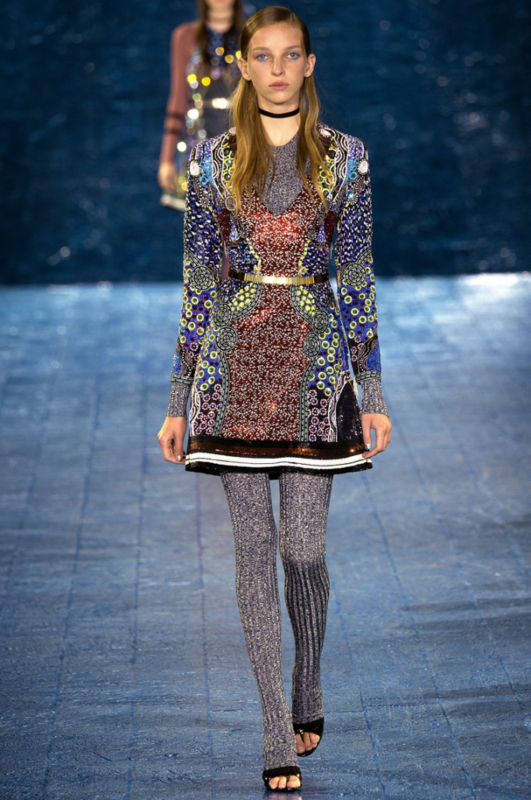 All 39 looks hit the runway with various striking patchwork patterns in a multitude of colours making up the DNA of the Katrantzou girl. See my top three looks below from the SS6 Collection! The rather expansive conceptual backdrop to Mary Katrantzou’s collection this time around was “an exploration of exploration” encompassing “two ideologies, cosmic and chaos”. Very broad ideas then, both mentally and spatially, but they didn’t weigh down the clothes with their heft. Instead, there was a lightness of touch in the designs which were frequently cut into graceful ruffles and finely sculpted hems: all couture-esque, highly skilled, atelier work. The sense of expanse manifested itself most clearly in the range of intricate embroidery and patterns on show. That term “cosmic” seemed an apt descriptor for some of the fabrics used, which glinted and astounded in their sheer intricate complexity: mini-diamond quilts took on a metallic sheen while at times four different types and scales of floral merged together on a single piece. It was a balancing act that was anything but simple. If exploration was at the forefront of Katrantzou’s mind during the conception of this collection, then it should come as no surprise that she cherry-picked cuts and styles from all over the world: Romanian gypsy dresses and folk-inspired chic from the Balkans were both present alongside the traditional French high-fashion refinement that characterised much of the collection. Ironically, given the high-minded vastness of her theoretical inspiration, the biggest takeaway from the show was an admiration for the microcosmic excellence of Katrantzou’s clothes: the perfect poise of her cuts, the precision involved in those delicate mazes of lace, and the carefully engineered quality of that structural layering. This entry was posted in Design, Trend Reports and tagged fashion, london fashion week, mary katrantzou, SS16, womenswear, Wonderland. Bookmark the permalink.